Guinness & Basil: Come and get it! 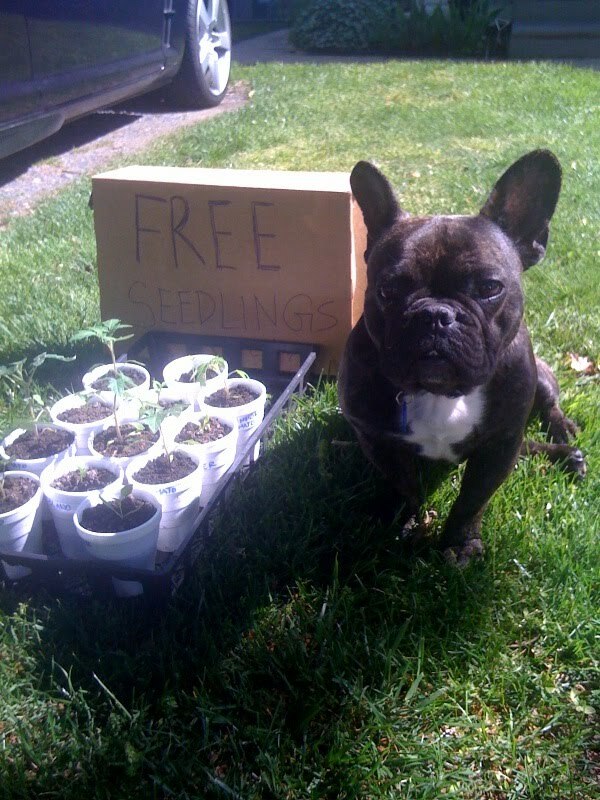 Free seedlings! Get your free seedlings! Mommy: Basil, sit here and help mommy give away these extra tomato and pepper plants. Basil: But I don't wannaaaa. Mommy: Quit whining Basil. Be a good helper. Basil: But what will I eat then when I go into your garden bed? Mommy: Okay, stay here until they are all gone. Basil: But mom, it's so embarrassing. All the other dogs will laugh at me. Mommy: Just be yourself and everyone will love you. You are such a good little Frenchie to help your momma guard the free seedlings even though you didn't wanna! You a fantastic role model for all of the neighborhood doggies and pretty soon they will be on their best behavior with their moms too! I found your blog thru "Brutus the Frenchie" and I enjoyed reading so much that I am now a new follower! If you want to meet a lot of dogs, cats, and other creatures, please come on by and say hello! Basil, are you being asked to... W O R K? I think your parents need to reread the Frenchie handbook. W O R K is a four letter word that should never be uttered in our direction. BTW, I had a public Yo-Yo poop this morning. Awkward situation for mom. So nice to help your mom :) Surprised there wasn't any basil in those seedlings!! Your momma is correct 100%!!! Just be yourself. Don't change a thing. We love you just the way you are, Basil!